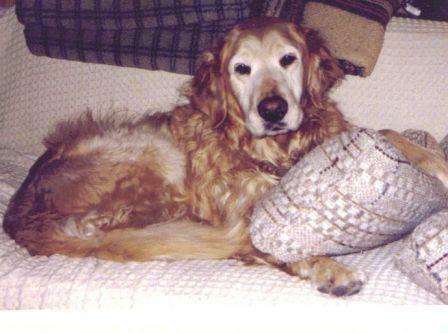 Alex was our first Golden. He was the reason we fell in love with the breed. He was just a "good 'ol dog", and although he wasn't the most "beautiful" Golden we owned, he had the absolute PERFECT temperment. Alex loved everybody and didn't know a stranger. Only once did I see the "protective" side of him that every canine posseses. I was taking him on his daily walk around the Elementary School we used to live around. A stranger lurking in the shadows jumped out at us, and Alex let him know that this wasn't going to happen...not today. I never forgot that. He saw us through our first years of marriage, 2 of our 3 kids, 2 houses, several cars, and many other Goldens. He loved every one of them. He loved to track and earned his TD easily...my first title. Obedience wasn't exactly his game, as he hugged my leg more than he healed. It is because of Alex that we joined the local Golden Retriever Club (DFWMGRC) as well as the National Club (GRCA). It is because of Alex that we purchased Andrew and my love Arthur, and Anna, who had our first litter. We owe Alex a lot. And we sure do miss him.